One .9 gallon pail will cover approximately 12 square feet at 1/8” thick or 35 linear feet of 4” wide repair at 1/8” thick. 10 ounce tube coverage is dependent upon depth and width of areas to be repaired. An acrylic emulsion patch material designed for repairing cracks, seams, edges around skylights, vents, and metal joints. Dries white. Clean Roof - Sweep off all dirt, dust, and debris. Remove rust, mildew, oil, grease, or other foreign material on the surface. Scrub roof with solution of TSP (Trisodium Phosphate) and water. Remove mold and mildew with bleach solution (1 part chlorine bleach and 3 parts water). Rinse thoroughly and allow to dry. Applying Roof Patch - Stir pail thoroughly. With a 4-inch wide paint brush, apply a liberal amount of Elastomeric Roof Patch. Apply Roof Patch 6-inches wide along cracks, seams, or vent areas. Roll Reinforcing Fabric into wet roof patch. Smooth out fabric with paint brush. While material is still wet, brush another coat of Roof Patch over the Reinforcing Fabric. Make certain the fabric is completely embedded into Roof Patch material. 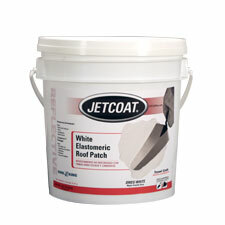 Allow Roof Patch material to dry thoroughly before applying White Elastomeric Roof Coating. 66221 .9 gal. Pail 11.6 lbs. 66249 10 Oz. Tube .85 lbs.